These Chips had a good, medium thickness style of crunch. Not a light, crispy shatter as you might find with a regular bag of Chips, but they were not hard and brittle or snap, crackly as are many Kettle Cooked chips. Although there were some irregularly shaped Chips, there were not as many really bendy or folded Chips as are often found in a bag of Kettle Cooked. Neither were there as many oil bubbles as you may see. For a Barbecue flavored Chip there was minimal character and not much visible seasoning. The general glow was an orangy dark yellow with the the odd seasoning fleck here and there, but that is all. An early hint of sweetness and perhaps a little smoky spicy tomato. The heat factor was pretty good. Unlike many Chips of a similar flavoring the sweetness was not held back by a salty undercurrent. 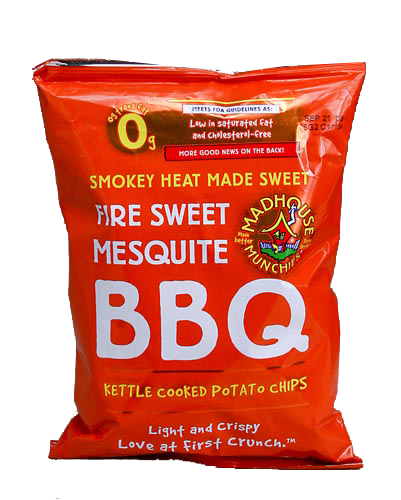 The smoky nature of the Chips sustained a popular-to-the-masses style of medium strength Barbecue flavoring.